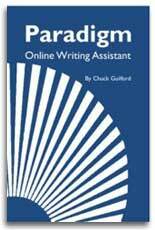 You may use Paradigm Online Writing Assistant (HTML) free of charge for any educational or nonprofit purpose. Please give appropriate acknowledgment. For other permissions contact the author directly. This resource would not exist without the direct and indirect assistance of many groups and individuals, some of whom I'll never know and others whom I know quite well. I'd especially like to thank my family—my mom and dad, and my sons, Geoff and Nick. Of special note is my brother Tom, who believed in this project and collaborated with me on an earlier version of Paradigm that ran as a Windows® Help file. His untimely death in 1994 was a great loss in many ways, but I think he'd be glad to know his influence continues in this Web version, which, as he'd no doubt remind me, would be much better if he'd been working on it. Actually, Paradigm is a distillation and collage of numerous writings, talks, and activities that I've developed over the years and tried out on students, colleagues, and mentors with varying degrees of success. I can't thank everyone individually here, but I would like to mention a few: Ken Macrorie, who taught me to love what Ezra Pound called "this damn'd profession of writing"; Don Stewart, who helped me believe I could make a living at it; Charlie Davis, who made basic writing a cornerstone of the B.S.U. English Department; Carol Martin, Chaman Sahni, and Ken Sanderson who supported and encouraged me in this project; and to Ross Nickerson, technical guru, and Steve Grant, graphic design wizard. Thanks, especially, to my students and colleagues at Boise State, an inspiring group of writers, scholars, and teachers that I've been honored and delighted to work with. Discerning readers will note the influence of others, too. Maxine Hairston, Lisa Ede, Peter Elbow, Mina Shaughnessy, Donald Murray, Edward Corbett, Frank D'Angelo, Kenneth Burke, Ross Winterowd, James Britton, Richard Lanham, and Stephen Toulmin have all had enormous influence on my thoughts about writing and my teaching of writing. And finally, thanks to Pam Peterson, with whom I've shared and discussed this project in several versions. Her help, advice, and support have been vital throughout. To her and the others mentioned above, much of the credit for what's right here. The shortcomings, unfortunately, are my own fault. Chuck Guilford has thirty years experience teaching a variety of university level courses. He holds a Ph.D. in English and is presently an Emeritus Professor of English at Boise State University, where he has taught composition, creative writing, and literature classes at both graduate and undergraduate levels. He has also taught numerous writing workshops for young people. He is the creator of Paradigm Online Writing Assistant and Poetryexpress Websites, and his textbook, Beginning College Writing, was published by Little, Brown. 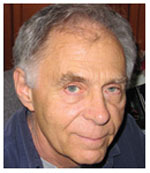 He is also the author of many poems, stories, essays, reviews, and articles, which have appeared in Poetry, College Composition and Communication, College English, Coyote's Journal, and other places. 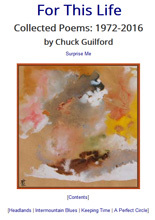 What Counts, a chapbook collection of his poems, is available from Limberlost Press. His novel, Spring Drive: A North Country Tale, is available from Wordcurrent Press, as is his new book Altogether Now: Essays on Poetry, Writing, and Teaching. A longtime member of N.C.T.E. and C.C.C.C., he is a frequent conference participant and is the founder of the Council on Basic Writing (C.B.W. ), a 4C's special interest group. For more information, visit his home page.